AMY DOLORES HEAD COACH AT FEEHAN! Long-time assistant moves up to head coach of the powerful Feehan girls hoop program. ATTLEBORO, MA (April 12, 2019) – Bishop Feehan High School is proud to announce that long-time girls basketball assistant coach Amy Dolores will be taking on the head coaching role for the Shamrocks, effective immediately. Dolores takes over for former head coach, Mike Deady, who stepped down in March after a highly-successful 21-year run atop the program. Dolores brings a passion for the game of basketball and a commitment to empowering and leading young women to her new position. Coach Dolores captained the 1999 Lasalle Academy (Providence) state champion girls basketball team before heading off to Villanova University for college. Dolores also currently serves as a math teacher at Feehan. “I am honored to be the next head Girls Basketball Coach at Bishop Feehan. The support I have received from the Feehan community and beyond has been tremendous,” said Dolores. “I am extremely excited for the opportunity to work with our student-athletes to create an environment where they can reach their potential both as basketball players and as young women. 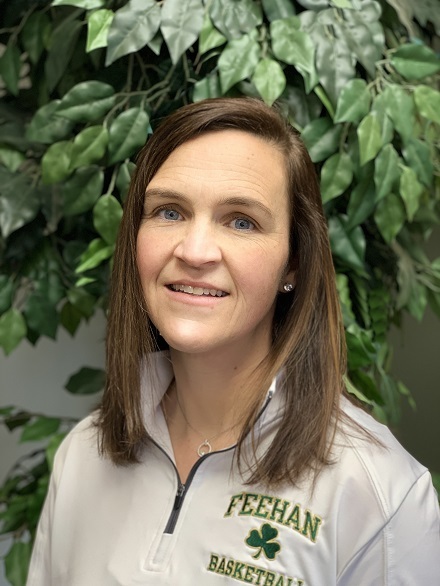 At Feehan, Dolores has served as freshman coach, JV coach and varsity assistant in ten years on the sidelines and Dolores brings over ten years of coaching knowledge to her new role with the Shamrocks. At the same time, she has been heavily involved with summer basketball camps and clinics as well as volunteering extensively with Mansfield youth sports. The Feehan program that Dolores will inherit has seen a steady stream of success over Deady’s two decades at the helm with league titles and long state playoff runs almost the norm. Dozens of Shamrock hoopsters have gone on to play in college, and the program won the Division 1 state title in 2016. Dolores lives in Mansfield with her husband and three children.